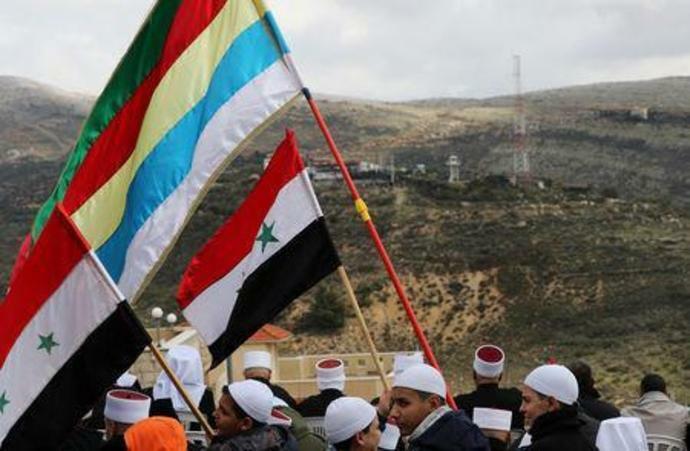 MAJDAL SHAMS, Golan Heights (Reuters) - Druze Arabs and Israeli settlers on opposite sides of the dispute over U.S. President Donald Trump's support for Israeli sovereignty over the Golan Heights agree on one thing - it won't change matters on the ground. The two armies are divided by an "Area of Separation" - often called a demilitarized zone - into which their military forces are not permitted under a 1974 ceasefire arrangement. "The U.S recognition of Israeli sovereignty in the Golan makes us happy, however our daily routine does not involve dealing with whether Israeli sovereignty is being recognized or not," said Haim Rokah, head of the regional Israeli council in the Golan. "I don't think Trump's announcement will make any difference here. It's not going to change anything. The residents in the Golan already feel like they're Israelis. They have a better life than being in Syria or any Arab country - just look what happened in the war in Syria," he said. "Some will say that this is 'Trump's election gift to Netanyahu.' Some will say that these are 'two people in legal troubles who are convinced that there is a global conspiracy to topple them,'" wrote Alon Pinkas in Yedioth Ahronoth. Nabil Abu Rudeineh, a spokesman for President Mahmoud Abbas, told Reuters: "These promises will not give legitimacy to the Israeli occupation and the Golan will remain Arab and Syrian land."